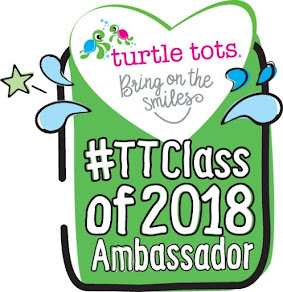 Back in June at Britmums Live I signed up to become a Parragon Book Buddy. The two books I'm writing about are the September and October books for babies/toddlers. I have been so swamped with work, moving stress and general day to day stuff I've been delayed at getting this post up! 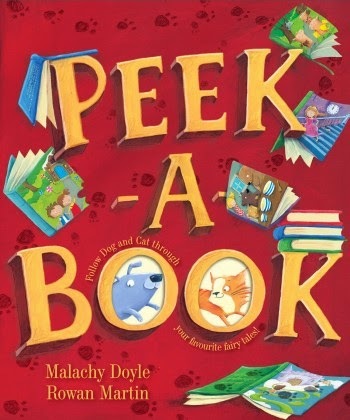 The September book, 'Peek-A-Book' by Malachy Doyle was out of Stock when it was due to be sent, so it was sent along with the October book. After reading it myself I could see why had been out of stock. The teacher in me immediately saw the opportunities for discussion on each page, it is a book that will appeal to all fairy tale fans. It is a story I imagine reading to a whole class and the children being excited by it, especially when recognising some familiar characters. The two main characters in the story are a cat and a dog. The dog chases the cat on to different pages, each page has a part cut out or is shaped differently. As the cat jumps on to a new page, she also jumps into a different fairy tale. The illustrations are bright and colourful which are very inviting for children. As a story it's obviously too old for Eliot to enjoy at the moment but he has loved flicking through the pages and looking at the pictures. I envisage it as a book we will enjoy together for years to come and eventually Eliot being able to read the story to me! I highly recommend this book for older tots and children in key stage one, it would make a great stocking filler and you can buy it here. 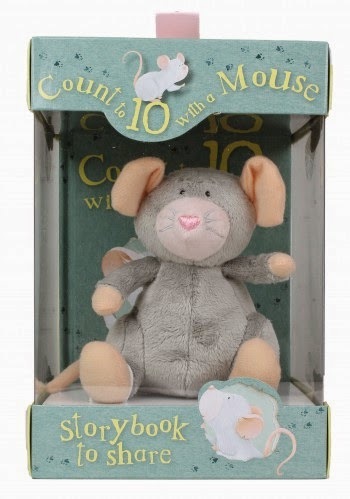 The second book we received was 'Count To Ten With Mouse' by Margaret Wise Brown which came in a gorgeous gift set complete with cuddly mouse! Although I must admit I can't look at the book in the same way after my own encounter with a real mouse at the weekend but I won't get into that! This again is a book Eliot has picked up and happily flicked through, with a bit more ease as it's smaller and the cover is hard back. A key element of the book is that it features a mouse size hole on each page, the idea being the mouse hs crawled through which I think is cute. The book has rhythm and rhyme which will draw in children to listen to the story along with the repeated pattern of the book. I think it's a lovely book that has a bit more to it than most number books for tots, which often just feature the numbers. It has a story to it too which adds depth to it. As it comes in a lovely gift set this is a fab Christmas present, children can never have too many books! To order click here. *Disclaimer we were sent the books in exchange for a review as part of the Parragon Book Buddy Programme.